The first clue, if you didn’t’ catch it, outs that the phone will “have the power of 4G LTE.” With the Atrix HD and Photon Q already announced, what else could it be? The only phone of Motorola’s on anyone’s radar these days that hasn’t been unveiled, would be the DROID RAZR HD. 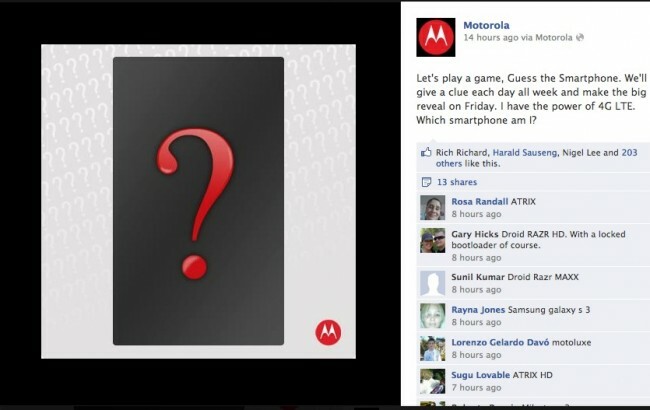 Update: Just as we speculated above, Motorola is not going to announce a new phone, but are simply playing a game. TechRadar was able to chat with a Moto spokesperson who said that this game is about “current” smartphones available, not a new one. Again, a new clue will be dropped each day, so stay close to Moto’s Facebook page to find out.